How many times have you thought about hiring a digital marketing agency and said to yourself something like, “but they’re not an expert on my industry“? Maybe you’ve thought that in order to have a professional agency handle your content creation or integrated digital marketing, it has to be a firm with experience in your specific niche. Or maybe you’ve held back on investigating a professional digital marketing firm because you think nobody could know what you do enough to market it well. Well, let’s clarify some things here. You’re only partially right. The fact is that many agencies do specialize in specific niches or industries and if you are doing a lot of cookie cutter, duplicate marketing for many clients, there may be an advantage. Albeit, the advantage is likely going to be to the agencies benefit and not to you. You see, if you want to put out identical cookies over and over again, knowing that specific single recipe and duplicating it again and again for numerous clients may get you the same repeated cookie, but you’ll likely not get the best tasting one that keeps you coming back. Cookie cutter marketing is cheap because it does not take into account your specific business and how it’s different from all the others in your industry. Cookie cutter marketing is based on the notion that “we’ve done that before”, rather than what do we need to know about this client, their target customers and what makes them better and unique. This research and resulting information results in a NEW recipe that is better. Let’s be honest here. We weren’t experts in flooring, organic produce, mobile home services, B2B Saas technologies and many other industries before working with some of our clients. 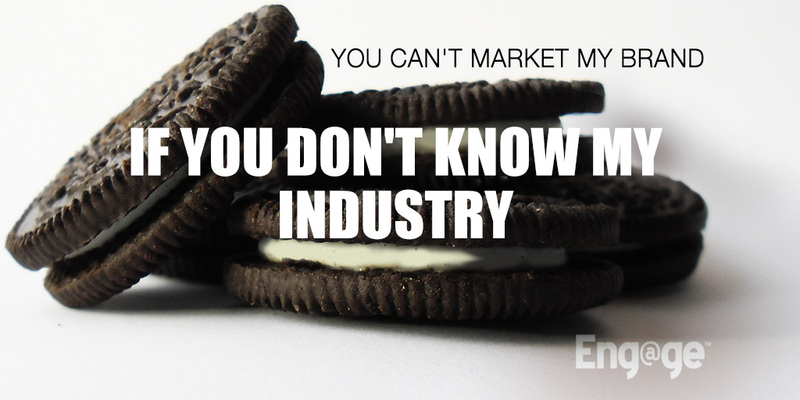 But what makes us effective isn’t that we knew everything about an industry before signing a new client in a specific market or niche. What makes what we do for our clients achieve real dramatica results is our deep understanding of the digital landscape, the platforms and tactics required depending on a specific client’s business and audience. Then using our integrated digital marketing expertise to conduct substantial research on our client’s products and services, their general industry and competition, then formulating and executing an effective strategy that will win. The First Thing Your Digital Marketing Agency Should Do? If you want to vet a digital marketing agency you’re considering working with, ask them a few questions about how they work with new clients. Specifically, find out if they do research at the beginning, what they research and how much time they spend on research before coding, designing or posting for a brand. If you know what these answers should look like, you’ll be far less likely to end up in a bad business relationship. Before we do anything for a new client, we spend an enormous amount of time on research. What’s enormous? Well that depends on the client, the industry and their target audience, but we will give you some more specifics to help you clarify that you are going to work with a credible, effective digital marketing company. The Client: We spend a lot of time getting to know our client and their business. We have to capture what they do at a substantial level and how what they do converges with how they do it. In other words, we have to understand their company culture, approach to the market and what makes them who they are as an organization. Their Products/Services: This is where the amount of time on research varies quite dramatically from client to client and industry to industry. Understand the products and services one of our new clients provides is crucial before any strategy or marketing is deployed. This process can be grueling, but no less important in the overall effectiveness of what is accomplished later. The Client’s Market Advantages: We’ve found that nearly every client has a handful of things that make them unique over their competition. Some of these are real differentiators that need to be understood well and later incorporated into product and brand messaging. Uncovering a client’s distinct advantages in the marketplace has a real impact on the digital marketing strategy. The Client’s Market Weaknesses: Though most of us never like to admit it, most businesses have a weakness. In fact, there’s usually many more than just ont. If our client doesn’t know their market weaknesses, I guarantee you that we are going to find them in our research. If our client thinks they know what their market weakness is, I guarantee you that we will either validate or disprove it with our research. The Client’s Customer Persona’s: You’d be surprised how many mid-sized small businesses don’t truly know who their customer is. They may have a general idea, but it is based on experience and gut feelings, not actual data. We spend the time to research your current and future customers and develop clear personas that everyone in the organization can understand. The Client’s General Industry(ies): General industry research is crucial. Yes, we do need to know a lot about our specific client’s business, but they are generally apart of a larger industry as a whole. We research the larger industry market to gain insights on the everall industry at large. The Direct and Indirect Competition: We have to know who your competitors are. Not only those direct competitors that you know are a threat, but we also uncover the ones that you didn’t know about. Researching our clients competition in detail, provides a lot of information about what in their marketing is doing well, where they are missing and how to take advantage of those opportunities. The fact is, if the digital agency you are speaking to doesn’t roll this list off their tongue within seconds of you asking the question about research, they’re likely not the agency for you. It’s your brand and your business that is being represented here, so hiring an agency to handle your online marketing isn’t something to take lightly. You are bringing on a partner that you will need to trust and rely on to do their part well. If they aren’t willing to become a partner by investing in the necessary hours, days and weeks of research to understand your business, customers, market and industry, we can assure you that things are not going to go all too well. We are only halfway there. You see the data that is accumulated through the days and weeks of research, if done properly, can then be used to develop a highly customized strategy that takes into account all of the relevant information in the research phase. 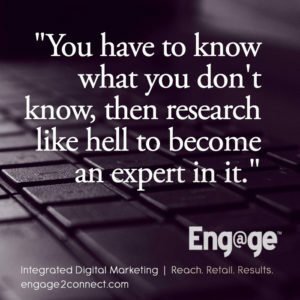 The process that is used to convert the valuable research data into a strategy that will rapidly drive results for your business also takes a substantial amount of experience, knowledge and time. So whether or not a marketing firm has experience in your industry shouldn’t be the driving force in your decision of which company to hire to manage your digital marketing efforts. 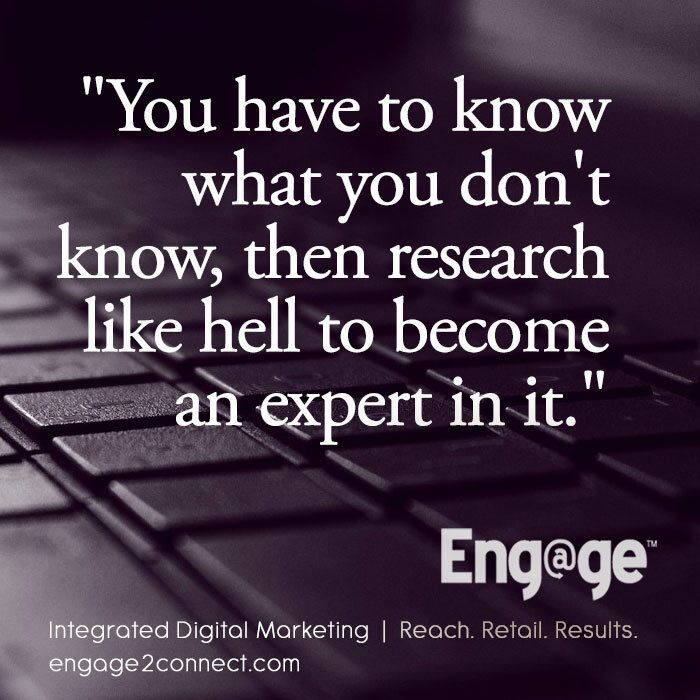 The right marketing team understands the role of research early on, developing an effective marketing strategy, then incorporating ongoing research for every piece of content that is developed for your brand. For more on what it takes to make marketing effective, click here.